Successfully cultivating your connections on LinkedIn is as key to maintaining a strong professional network as an organized Rolodex once was. If you’re not already… you should really join with the LinkedIn ecosystem. Yes I know some otherwise reasonable and successful people who shun social networking sites and are consciously absent from places like LinkedIn and Facebook. But doesn’t it feel a little strange when you opt out of a major tool that people use to interact with each other? It would be like not having a cell phone. Or a landline a couple generations back. These days, I think everyone needs an online presence. Otherwise, at some level, do you even exist…? No, you don’t necessarily need your own website, but the sad reality is you no longer get to make your first impression in person. Today, you can instantly look up a name on LinkedIn, view a photo and digest an entire career. That’s much more than anyone needs to glean a first impression! And if you’re the kind of person who’s focused on nailing that first firm handshake at a meeting, don’t bother. The whole room probably knows more about you than your local bartender. If you haven’t figured this out yet, your LinkedIn profile effectively functions as your resume. Whether that’s your intention or not, it is. No, it shouldn’t be as detailed as your actual resume, but LinkedIn is where someone will often turn to check out your background. So if you happen to be applying for a job, know that your LinkedIn profile has a strong chance of being viewed by the hiring manager before the resume.doc you uploaded gets opened. Are you somehow better off if you have 300 connections, as opposed to 23? What does a big number say about you? Well, it shouldn’t say anything… other than you’re a strong networker. I think the conceptual jump is the more people you’re connected with on LinkedIn, the more successful you are. Or at least it suggests all those people have enjoyed working with you. Why else would they have agreed to connect in the first place? Well… a healthy-sized network wields its own power. By association, your network brings you closer to a much larger universe… all those people your contacts are connected with….your 2nd-degree connections. It’s weird to say, but for that population of strangers with two degrees of separation from you, a low-grade familiarity is already present. This irrational sense of connection exists just because you both know someone in common. Who Should Be a Connection? Once upon a time, I thought you should only connect with the colleagues you work with throughout your week. The ones you know really well. Eventually, I expanded this strict rule to include people I’ve enjoyed working with on a specific engagement. I figured you don’t need years to determine if someone is ‘worthy’ as a LinkedIn connection. Then I had to decide what to do with invitations from people I’ve only met, but not worked with. That seemed like a stretch… but then I realized that it was a reasonable networking tactic. If you decide it serves your larger networking goals, and so does the other person… where’s the harm in that? And there’s all those 2nd-degree strangers you already kind of know, but don’t. I get invitations from complete strangers. cold-calling technique. I don’t think I’ve ever accepted one of these requests. Come on… At least introduce yourself and say something interesting that might encourage me to connect with a complete unknown. Just using the default wording says you don’t think I’m worth any extra effort other than clicking on my name. And that same philosophy applies when you’re trying to connect with someone you know, but it’s not a slam-dunk they’ll accept. A prime example is when it’s more of a reconnection moment… when you haven’t been in touch with that person for years, and suddenly you send them a LinkedIn invite out of the blue. Don’t be so lethargic as to let the default hello represent you. If it’s a list of 400 people you can’t easily remember, then what have you really accomplished? 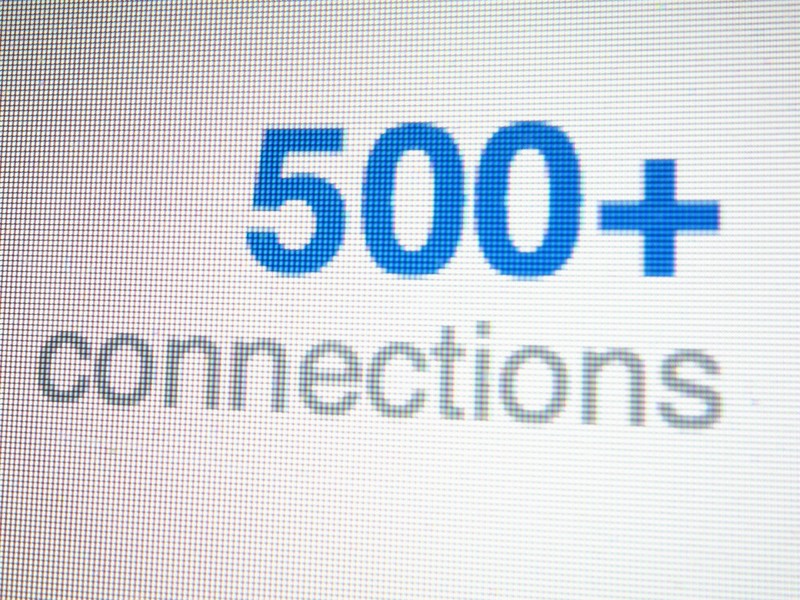 I think properly crossing the 500+ connections threshold simply reflects an organic and ongoing effort. Over the years of your career, keep paying attention to new colleagues and others you want to have in your network. Invite them as a LinkedIn connection as soon as you’ve completed some great project together. Don’t just think of LinkedIn when you’re looking for a new job. Building out your list of connections is a career-long process. If you’ve made the wise decision to create a strong professional network, you’ve also got to nurture and protect it. That’s another reason to not connect with someone you don’t know. You probably don’t want some stranger to suddenly have access to the rest of your 1st-degree network. Sure, you can turn off that functionality in your LinkedIn settings, but shutting off access to your other associates may annoy some of your other connections. Do I mean to say your LinkedIn contacts don’t only love you for who you are… but they also may covet your connections…? Yes… I’m sure for some, you’re viewed as a package deal. I really see no downside to using LinkedIn as long as your paying attention to the quality of your connections. Just be sure to treat your LinkedIn exercise like a marathon…not a sprint. And don’t act like a robot!